Book this tour and amongst other things, receive a complimentary box set of New Zealand red and white wines as well as a possible international air flight ticket credit*. Experience the finest selection of New Zealand's marquee golf courses (See course descriptions below), luxury lodges and premium transport. Complimentary Premium Golf NZ Luxury Travel bag including gourmet New Zealand wine and cheese packs, decadent New Zealand artisan chocolate, New Zealand designed and made golf wear including a Merino wool jacket, New Zealand wood golf tees, Pro V1 Titleist balls & PGNZ markers - all with personalised tour labeling, plus 2x personalised Ralph Lauren Polo tour shirts and a Titleist cap! Due to the bespoke nature of this ultimate golf tour, costings will vary according to your travel needs. Preferential discounted rates are available upon request. " (Tour subject to availability and based on two person twin or double share. Actual tour group limited to 4 persons) Use the contact form below to book today. Enquire for price as groups with more than 8 (2 Helicopters) will receive a preferential 10% discount. When booking this tour, enquire for a international airflight credit to the value of NZD $1000.00. (Certain restrictions apply, Subject to availability and PGNZ T's& Cs. Limited availability. Book this tour and receive a complimentary twelve bottle set of New Zealand red and white wines. These can be shipped to your home address or used on the tour. Daily bottles of New Zealand water and complimentary glass of beer or wine after each round. Extend this tour to play at other clubs. This tour can easily be customised to include other courses, accommodation alternatives, sightseeing excursions, other golf regions, exclusive clubs, a Waiheke Island Wine Tour or other desired activities. See our New Zealand Signature Collection of tours here. 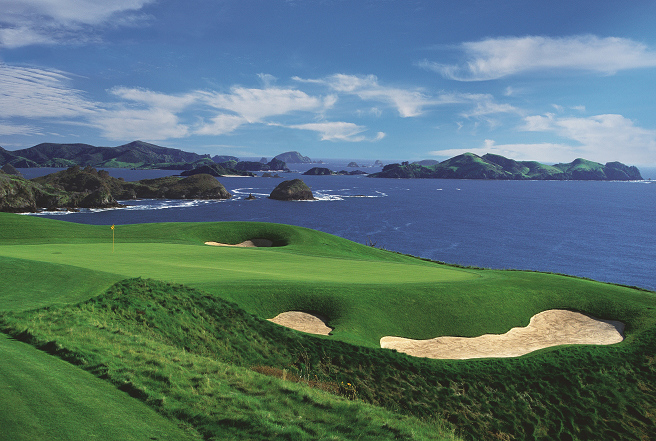 Enquire today to let us curate your personalised premium New Zealand golf tour. Suggested end of week itinerary: Thursday night to Sunday afternoon/evening in order to catch international flight home ready for Monday. Phone us, use the form below or request a sample itinerary via our booking page of this premium golf tour, including additional sightseeing activities. * Subject to availability, limited to 4 persons twin/double share. Travel dates between Oct 31 and Apr 1st, departing from Auckland. Premium Golf NZ Terms and Conditions apply. Your exclusive helicopter and golf sojourn is waiting.